You are viewing The Animals Section which is posted in the read category. Last Saturday I visited a used book store in Port Jefferson, New York. It was cold and blustery... a perfect day to wander the stacks without a plan. Smitten with the colorful covers and straightforward titles in my immediate view, I found myself in the section, ANIMALS, for a good long time. I never browse the Animals section, but at this shop that specializes in scholarly, scarce and out-of-print books I found it magical. 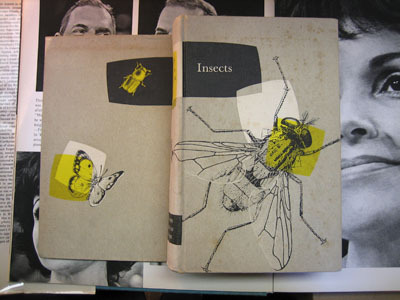 My favorite was a book simply called, Insects: Year of Agriculture, 1952 and credited to the United States government. 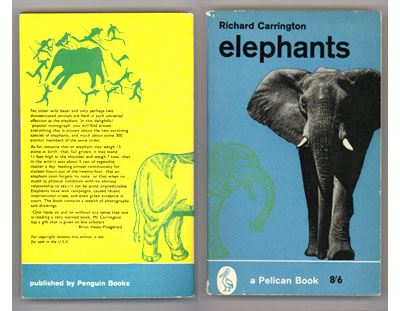 I avoided World of Snakes, but was drawn to a small paperback called Elephants. 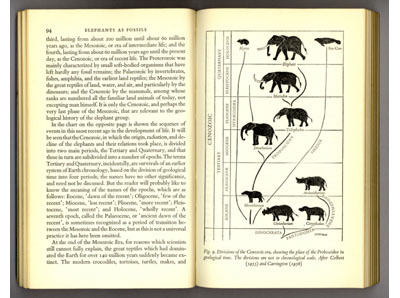 Published in 1962, it has a modernist cover, intriguing diagrams and enticing chapter titles like: "Love Among the Elephants" and "The Elephant Body and How it Works." For $3.00 it was mine. Next to a 1940s Audobon Guide to North American Birds, was a tempting picture book called, Kittens with cuddly white felines lounging on '70s era afghans and wicker chairs. My tour of the animal kingdom came to an abrupt end, however, when I opened a benign-looking book about do-it-yourself cat surgery. For some reason this reminds me of a book that my brothers and I used to always sneak to look at when we went to my great aunt's house when we were little. We called it "the disease book" because it had all these gross photos of elephantitis and other weird conditions. I guess that felt like adventure to us at that time! Yes -- those disease books were enticing as a kid. As were the Mutual of Omaha Wild Kingdom tv specials that showed a lion tearing apart a gazelle. Gruesome but alluring at the same time! I was just in that bookstore this weekend (dropped $45.00 on some harcover classics, including The Heart is a Lonely Hunter), and managed to overhear a conversation involving the current owner and an employee. The business is up for sale, and the owner hopes to retired by June. The asking price is $200,000. That doesn't include the physical building, but the name and the books, as well as the option to stay on the premises with a renegotiated lease with a new landlord. If I had a shred of business sense and $199,000 more than I do right now, I might be tempted to buy the place, a red-brick building near the Port Jefferson Ferry docks that could promise to be the heart and soul of Long Island. If the book store goes under, with no takers and no hope that the current owner will decide to continue ekeing out an existence as a purveyor or used, scarce and rare books, I might have to call in the air strike, unless someone can talk me out of it. No matter what, I'll try to buy out the remaining stock of animal classics in the meantime.